Dr. 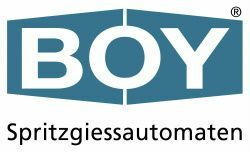 Boy GmbH & Co. KG, German manufacturer of injection moulding machines are pleased to celebrate 35 years of successful cooperation with its British representative and distributor BOY LIMITED. Just recently, Mr. Alfred Schiffer representing the German specialist for injection moulding machines, gave an award to its British partner BOY Ltd. as a reward for the successful collaboration of the two companies. 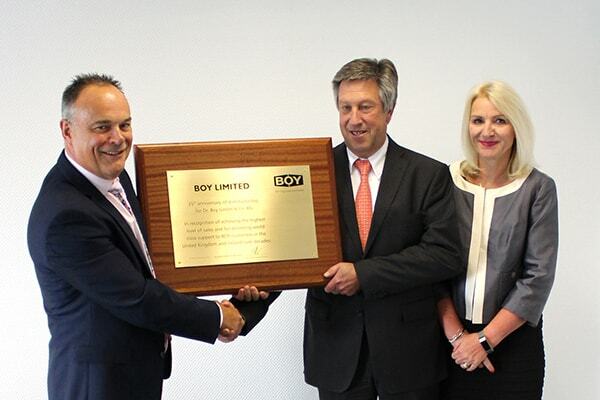 The British company, BOY Ltd. now based in Rushden, Northamptonshire, took over the responsibility for all sales, support and servicing of the BOY injection moulding machines back in Great Britain during 1983, Later these activities were extended to Northern Ireland. The company BOY Ltd, managed by Bob Wilson (on the left) and his wife Tracy (on the right), was one of the bigger BOY representatives right from the start. A large number of BOY injection moulding machines from the complete product range were sold into the varied and expanding British plastic industry. Furthermore BOY Ltd. offers its customers and prospects the opportunity to carry out mould and material trials at their comprehensive showroom in Rushden, designed solely for that purpose. “Certainly through both the good and difficult times we were always able to rely on BOY as our partner to create our current success“, remarked Bob Wilson when he was questioned about the current developments and the consequences for the British plastics market.